Hi there! 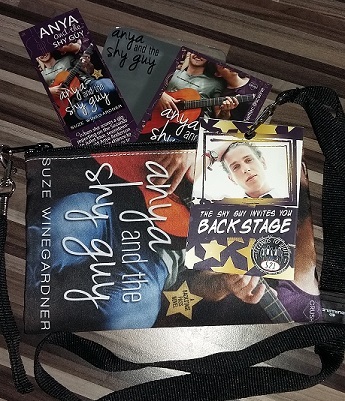 Today I’m sharing in the release day festivities for ANYA AND THE SHY GUY, the fourth book in the Backstage Pass series from Entangled Crush. I’ve already enjoyed MIA AND THE BAD BOY and DAISY AND THE FRONT MAN, so I jumped at the chance to catch this one! Anya and “Will” have a difficult road to love, but they persevere! This is the 4th book in the Backstage Pass series, but can be enjoyed as a standalone. Anya is a homeless teen who has managed to bluff her way into a gig as a reporter covering a two week stint on the Seconds To Juliet tour. Her assignment is to interview Will, the “shy” one and make daily updates to her online ‘zine. Anya knows that if she uncovers a big, dark secret about the band, she can sell it and get the money to move off the Tulsa streets. She has had a few articles published, but has posed as a married woman to attain her freelance job, even though she is only 17. Will Frey is in rehab after a pain pill addiction. In order to not be found in breach of his contract, his twin brother Matt has stepped into his shoes–only one member of the band knows Matt’s true identity, and Matt’s freaking out that Anya will discover his secret. In order to distract her, he attempts to seduce her–and ends up falling for her completely. This is a fun one! Anya and Matt are both good people trapped in uncomfortable positions. Anya is so used to being on her own, she’s shell-shocked at the attention of the band, and the sheer number of people that are part of the tour. She makes friends with the make-up woman, and Natasha is her first confidante in probably 5 years; surely since before her schizo mother abandoned her 3 years ago. Matt is, by turns, aggressive and reticent. He’s on constant guard against letting his secret loose, but he doesn’t have all the knowledge he needs to be a complete changeling. Like, Will didn’t give him accurate lyrics. And, Will neglected to mention Natasha was his girlfriend on the down-low. It’s a really clean read, with only the barest suggestion of anything beyond kissing ending in discomfort and giggles. Matt discovers that Anya has learned his secret, and he does the very worst thing possible, but he’s redeemed in the end–in church no less. I loved how the deception was resolved and really wanted to give Will a big smooch for fixing things, along with Matt. Plus, Anya gets a family of friends who are far better than any she could have been born to. Otherwise, it’s a light, fun read with some tender romantic elements and two HEA’s for readers to enjoy. Interested? 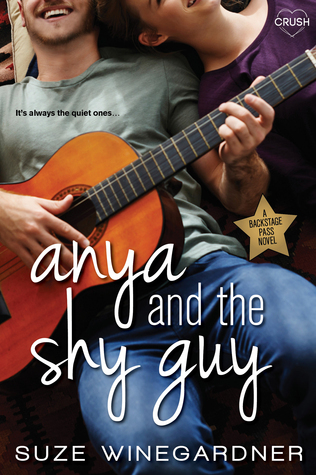 You can find ANYA AND THE SHY GUY on Goodreads, Amazon (US, UK, CA) Barnes & Noble, Kobo Books, and Googleplay. Click the Rafflecopter link below for your chance to win a fun AatSG swag pack! She is represented by Laura Bradford, of the Laura Bradford Literary Agency,and writes for Entangled Publishing‘s Crush imprint. She’s lived in London, Paris and New York, and has settled, for the time being, in North Carolina. When not writing, Suze loves to travel with her military husband, and take long walks with their Lab. Catch up with Suze online on her Website, Goodreads, Twitter, and Facebook. I loved this one too. Great review!